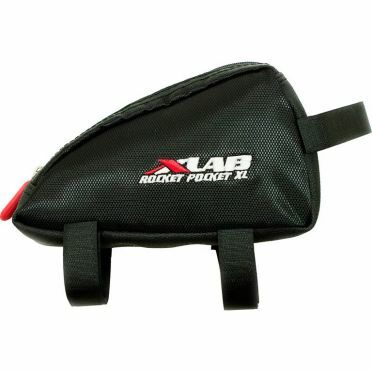 The XLAB Rocket pocket top tube bag black is a lightweight and aerodynamic bag with enough storage for mobile phone or other small items. The unique design allows the bag to be attached securely and easily onto the top tube using three carefully placed Velcro straps. Sleek, element-deflecting material stands tough against perspiration and electrolyte drinks. Highly visible, silver colored interior makes it easy to see contents and stay focused on the road. 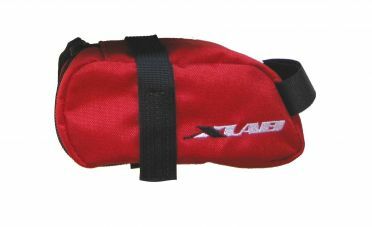 The XLAB Mezzo saddle bag red is discreet made from hardwearing fabric that is easy to keep clean and attractive. Featuring XLab graphics for a high-quality look. A 0.87l capacity makes it slightly bigger than the XLab Mini Bag so it will easily swallow up a tubular tyre, tyre levers, inner tubes and tools to get you back riding again quickly. Easy to fill with a multitude of items, whether it is a couple of CO2 Canisters, an XLab Nanoinflator, a pair of tyre levers, a handy multi-tool or even some cash, the possibilities are endless. 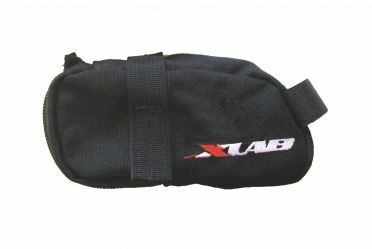 The XLAB Mezzo saddle bag black is discreet made from hardwearing fabric that is easy to keep clean and attractive. Featuring XLab graphics for a high-quality look. A 0.87l capacity makes it slightly bigger than the XLab Mini Bag so it will easily swallow up a tubular tyre, tyre levers, inner tubes and tools to get you back riding again quickly. Easy to fill with a multitude of items, whether it is a couple of CO2 Canisters, an XLab Nanoinflator, a pair of tyre levers, a handy multi-tool or even some cash, the possibilities are endless. 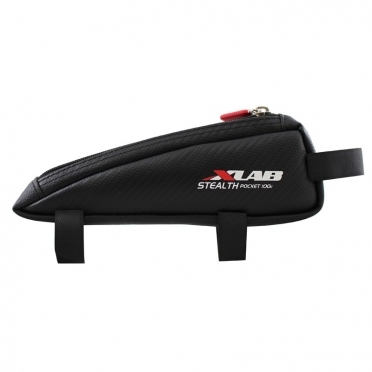 The XLAB Stealth pocket 400c top tube bag carbon has been designed specifically for bikes with angled stems or cable entering toptubes. The unique design allows the bag to be attached securely and easily onto the top tube using three carefully placed Velcro straps. Sleek, element-deflecting material stands tough against perspiration and electrolyte drinks. Highly visible, silver colored interior makes it easy to see contents and stay focused on the road. 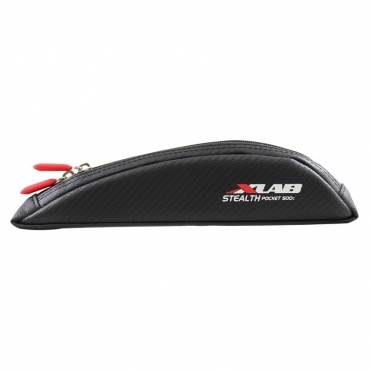 The XLAB Mini saddle bag black is discreet made from hardwearing Cordura 500 denier fabric that is easy to keep clean and attractive. Featuring XLab graphics for a high-quality look. 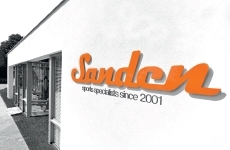 A 0.4l capacity is perfect for tyre levers, inner tubes and tools to get you back riding again quickly. Easy to fill with a multitude of items, whether it is a couple of CO2 Canisters, an XLab Nanoinflator, a pair of tyre levers, a handy multi tool or even some cash, the possibilities are endless. 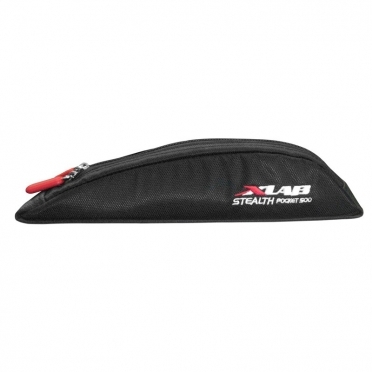 The XLAB Stealth pocket 400xp top tube bag mesh has been designed specifically for bikes with angled stems or cable entering toptubes. The unique design allows the bag to be attached securely and easily onto the top tube using three carefully placed Velcro straps. Sleek, element-deflecting material stands tough against perspiration and electrolyte drinks. Highly visible, silver colored interior makes it easy to see contents and stay focused on the road. Four outside pockets quickly stash salt, electrolytes, pain tablets or empty nutrition wrappers. The XLAB Stealth pocket 500c top tube bag carbon has been designed specifically for bikes with internal cable routing and frames featuring two toptube screw inserts. The unique design allows the bag to be attached securely and easily onto the top tube. Sleek, element-deflecting material stands tough against perspiration and electrolyte drinks. Highly visible, silver colored interior makes it easy to see contents and stay focused on the road. 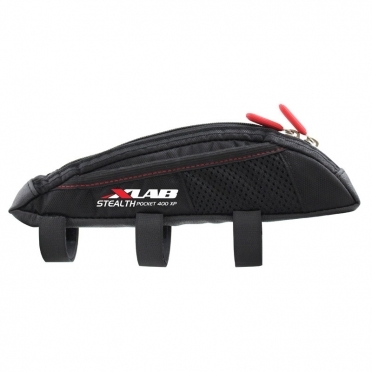 The XLAB Aero Pouch 300 saddle bag black is a lightweight and aerodynamic bag with enough storage for mobile phone up to 171.45mm diagonally and 6-8 gels. The unique design allows the bag to be attached securely and easily onto the top tube using three carefully placed Velcro straps. Sleek, element-deflecting material stands tough against perspiration and electrolyte drinks. Highly visible, silver colored interior makes it easy to see contents and stay focused on the road. 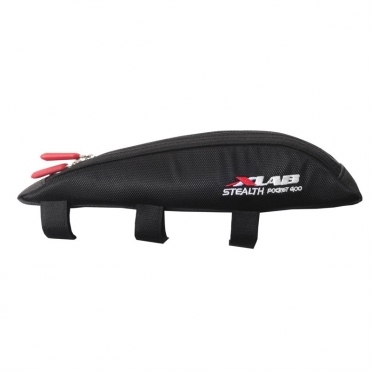 The XLAB Stealth pocket 400 top tube bag has been designed specifically for bikes with angled stems or cable entering toptubes. The unique design allows the bag to be attached securely and easily onto the top tube using three carefully placed Velcro straps. Sleek, element-deflecting material stands tough against perspiration and electrolyte drinks. Highly visible, silver colored interior makes it easy to see contents and stay focused on the road. 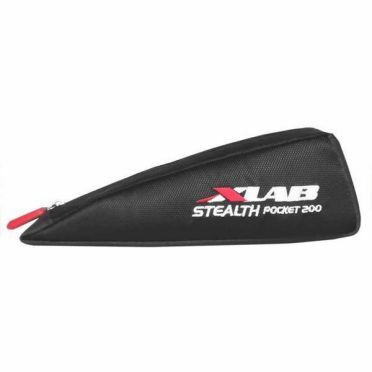 The XLAB Stealth pocket 500 top tube bag has been designed specifically for bikes with internal cable routing and frames featuring two toptube screw inserts. The unique design allows the bag to be attached securely and easily onto the top tube. Sleek, element-deflecting material stands tough against perspiration and electrolyte drinks. Highly visible, silver colored interior makes it easy to see contents and stay focused on the road. 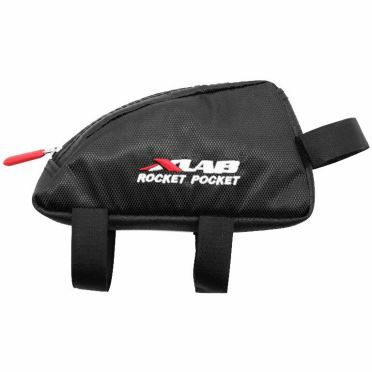 The XLAB Rocket pocket XL plus top tube bag black is a lightweight and aerodynamic bag with enough storage for mobile phone up to 171.45mm diagonally and 6-8 gels. The unique design allows the bag to be attached securely and easily onto the top tube using three carefully placed Velcro straps. Sleek, element-deflecting material stands tough against perspiration and electrolyte drinks. Highly visible, silver colored interior makes it easy to see contents and stay focused on the road. 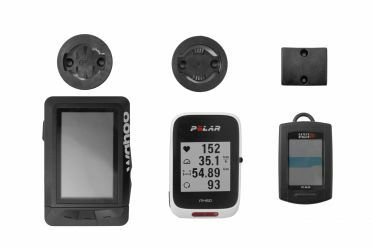 The XLAB Stealth pocket 300 top tube bag has been designed specifically for the Cervelo P5 and Trek Speed Concept time trial frames as the bag can be attached securely and easily onto the top tube using the frames allen key mounts. Sleek, element-deflecting material stands tough against perspiration and electrolyte drinks. Highly visible, silver colored interior makes it easy to see contents and stay focused on the road. 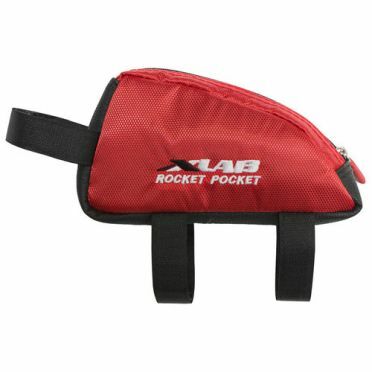 The XLAB Rocket pocket XL top tube bag red is a lightweight and aerodynamic bag with enough storage for mobile phone or other small items. The unique design allows the bag to be attached securely and easily onto the top tube using three carefully placed Velcro straps. Sleek, element-deflecting material stands tough against perspiration and electrolyte drinks. Highly visible, silver colored interior makes it easy to see contents and stay focused on the road. 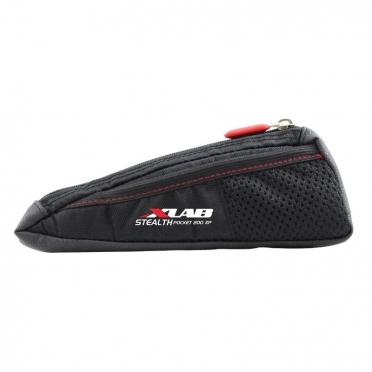 The XLAB Stealth pocket 200xp top tube bag mesh is optimized to increase aerodynamics for bikes with standard stems. Sleek, element-deflecting material stands tough against perspiration and electrolyte drinks. Stay stocked for the ride: Storage comfortably fits up to 1 bar and 3 gels. Highly visible, silver colored interior makes it easy to see contents and stay focused on the road. The stealth pocket 200 can easily be mounted to the top tube of your bicycle with 2 screws. 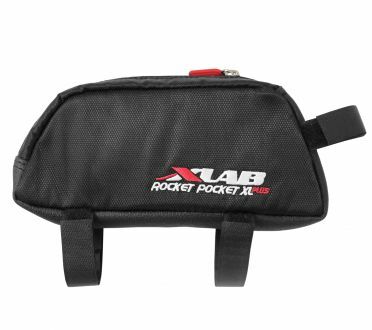 The XLAB Rocket pocket XL top tube bag black is a lightweight and aerodynamic bag with enough storage for mobile phone or other small items. The unique design allows the bag to be attached securely and easily onto the top tube using three carefully placed Velcro straps. Sleek, element-deflecting material stands tough against perspiration and electrolyte drinks. Highly visible, silver colored interior makes it easy to see contents and stay focused on the road. 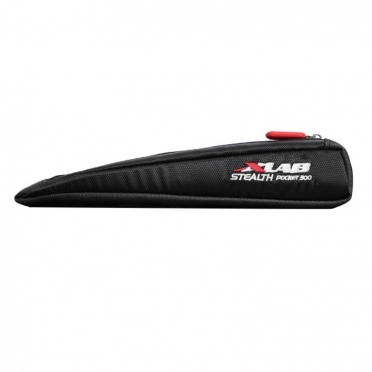 The XLAB Stealth pocket 200 top tube bag is optimized to increase aerodynamics for bikes with standard stems. Sleek, element-deflecting material stands tough against perspiration and electrolyte drinks. Stay stocked for the ride: Storage comfortably fits up to 1 bar and 3 gels. Highly visible, silver colored interior makes it easy to see contents and stay focused on the road. The stealth pocket 200 can easily be mounted to the top tube of your bicycle with 2 screws. 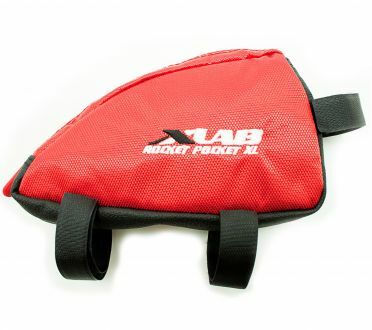 The XLAB Rocket pocket top tube bag red is a lightweight and aerodynamic bag with enough storage for mobile phone or other small items. The unique design allows the bag to be attached securely and easily onto the top tube using three carefully placed Velcro straps. Sleek, element-deflecting material stands tough against perspiration and electrolyte drinks. Highly visible, silver colored interior makes it easy to see contents and stay focused on the road. The XLAB Stealth pocket 100c top tube bag carbon is optimized to increase aerodynamics for bikes with standard stems. Sleek, element-deflecting material stands tough against perspiration and electrolyte drinks. Stay stocked for the ride: Storage comfortably fits up to 1 bar and 3 gels. Highly visible, silver colored interior makes it easy to see contents and stay focused on the road.